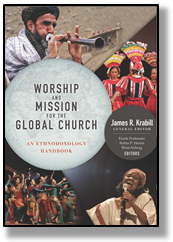 Worship and Mission for the Global Church: An Ethnodoxology Handbook offers theological reflections, case studies, practical tools, and audiovisual resources to help the global church appreciate and generate culturally appropriate arts in worship and witness. Drawing on the expertise and experience of over one hundred writers from twenty countries, the volume integrates insights from the fields of ethnomusicology, biblical research, worship studies, missiology, and the arts. To access the materials formerly available only on the Handbook DVD, click here. Books sold without a DVD will have the access codes printed on pg 60.